The past couple of weeks have been filled with home advancements! Last week we got our upper cabinets, textured the entry way, and painted. We painted the living room, the kitchen, and the entry way. It was a very good week. To top it off we textured the new part this weekend, which means we get to paint later this week! We have to sand the floors a bit so that they are level, but as soon as that is done we are prepared to paint. After we paint we can lay the floors. Yesterday mom, Kaley and I went to Canton and I found some awesome things for the house, that I am not allowed to show you yet. But I did take this picture while we were painting, that I am allowed to show you. It is not the best picture, but it will do. Looking back I could have spent some more time and taken a better picture, but after painting for five hours I was done. Home Depot boxes save floors. 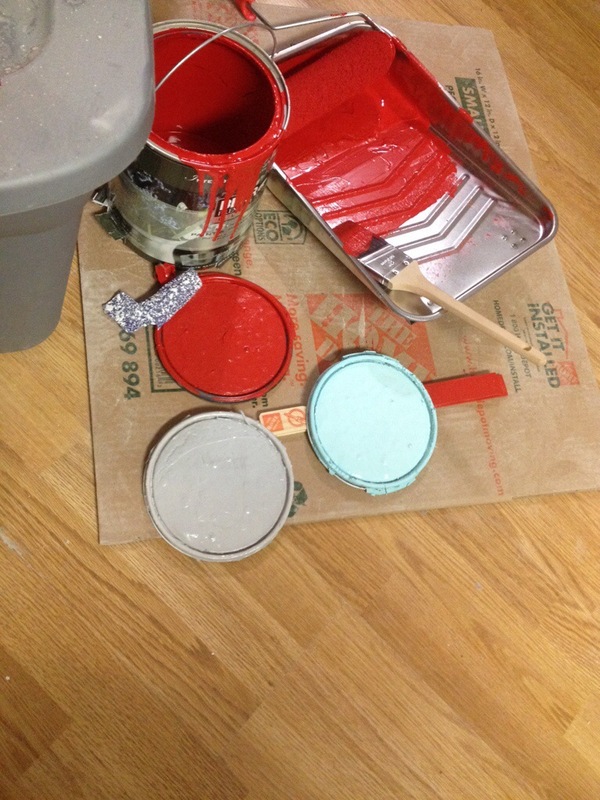 The red is for the kitchen walls, the blue is for our living room, and the gray is for the entry way. It looks really good. The picture doesn’t do it justice, I promise. That is all I can say for now, have a great weekend!